State of Mind: American Southwest I.
seeing friends and family along the way. off the beaten path- in the deserts, valleys, mountains and magic places, more small towns. Author tara lindaPosted on December 1, 2013 December 1, 2013 Categories Inspiration, TravellingTags Music tour, roadtripLeave a comment on State of Mind: American Southwest I.
Touring Texas: 1000 miles is just a lil’ Texas tour. Here are a few of the inspiring (and less than inspiring) things about being on the road. 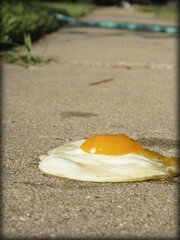 Yes, in a state that is 268,820 sq miles (696,241 km²), driving 1000 miles is considered a ‘stone’s throw’ of a distance. This is my 3rd time playing/touring with jazz band the Charles Hearn Quintet, and its awesome every time. Of course, like with any tour, it’s not all roses. The Regional Cuisine: Tacos and a “Texas Margarita” with limes and olives. I fell in love with this place in San Antonio: Dry Dock. Oysters, shrimp, fried catfish, hushpuppies. 6 cities of shows means we spend lots of time driving. From the Rio Grande Valley- Harlingen, McAllen, Weslaco, Brownsville, up to the central part of the state- San Antonio, Austin… This is why it’s only a “lil’ Texas tour” Ha! You may cover 1000 miles, but you miss most of the state! And so maybe next year we’ll take on new TX cities. Expand our horizons a bit. The venues. The audiences! (We were happy to see full houses each night!) The musicians. It’s always hard work to roll into town, cram in a bunch o’ rehearsals and hit the road for lots of shows in a short span of time, but this group keeps it fun. I learn lots from this jazz band, the Charles Hearn Quintet, and love ’em all 😉 !! An awesome band leader, producer, songwriter, musician, and all around great friend: this is Charles chillin’ in his über productive musical habitat. He & this space have made me happy hungry to get back to recording in my own space again. Which is exactly what I’ve been up to since coming home. October is my favorite time to escape the city and travel north. California’s coastal weather is clear and sunny in the fall (less foggy than summer believe it or not), and the magic of a redwood forest melts my city armor faster than any other place. 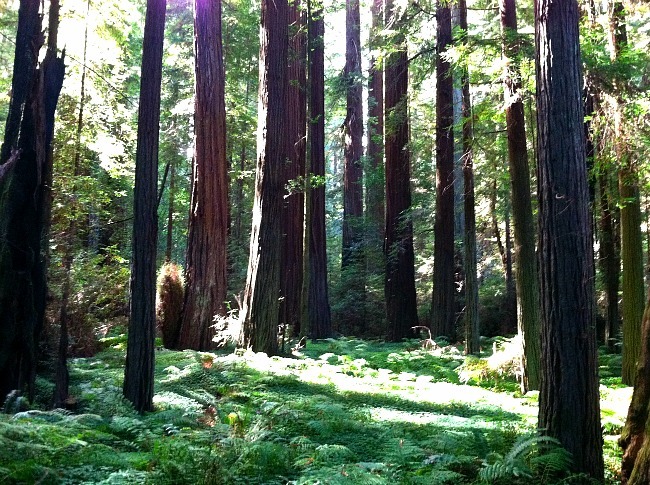 If you’ve never been to a redwood forest- Go. If you haven’t experienced a redwood forest- go. They are the tallest and most majestic life forms on land. And nothing like a redwood giant to make you feel very young and very small. 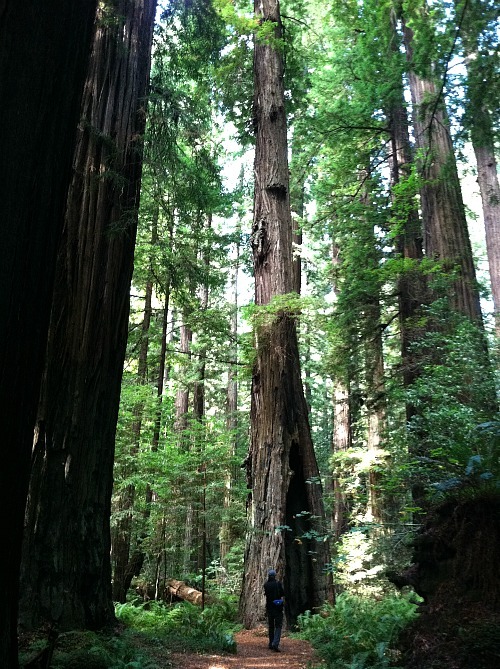 I recommend Prairie Creek Redwoods State Park with hikes from 1 to 12 miles. They have a healthy herd of local Roosevelt elk. My favorite hike; Fern Canyon- from the campground to the ocean. October is my favorite time to escape the city and travel north. California’s coastal weather is clear and sunny in the fall (less foggy than summer believe it or not), and the magic of a redwood forest melts my city armor faster than any other place. It takes about 4.5 hours to drive north from Oakland to Redway/Garberville. In this area- Humboldt Redwoods State Park with wonderful Avenue of the Giants, Founders Grove, and the largest old growth stands of Redwoods in the world. This year, we played a small concert at a winery/gallery there, leaving a couple of days to loiter and play. Hiking is always at the top of the list, and camping. But the rains usually start at this time too, and the forest floor can stay cold once it gets wet, so we roll with whatever happens. But even in the rain, it’s all beautiful. 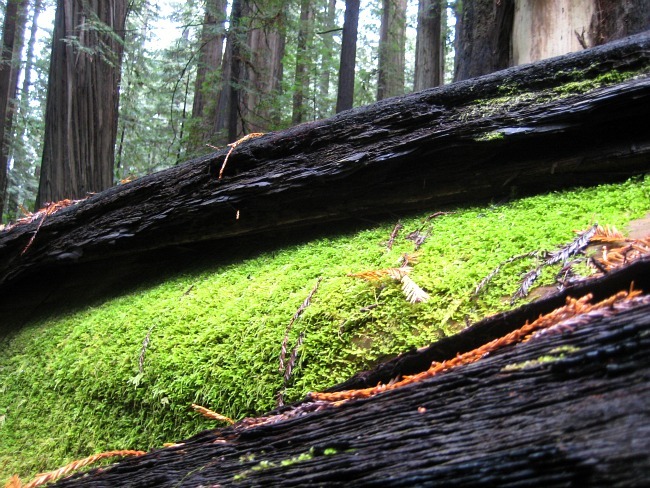 There really is nothing like the redwood forests of Northern California. 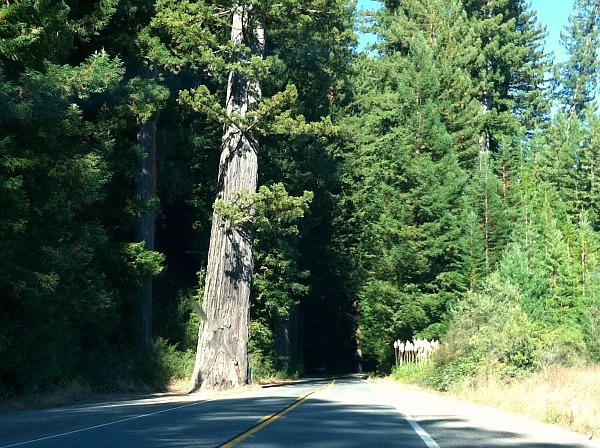 (OK- I confess my bias: I read that Oregon also has redwoods, and even China, but more than half of the old growth forests for coast redwoods (Sequoia sempervirens) are preserved in CA State and National parks of Humboldt County. 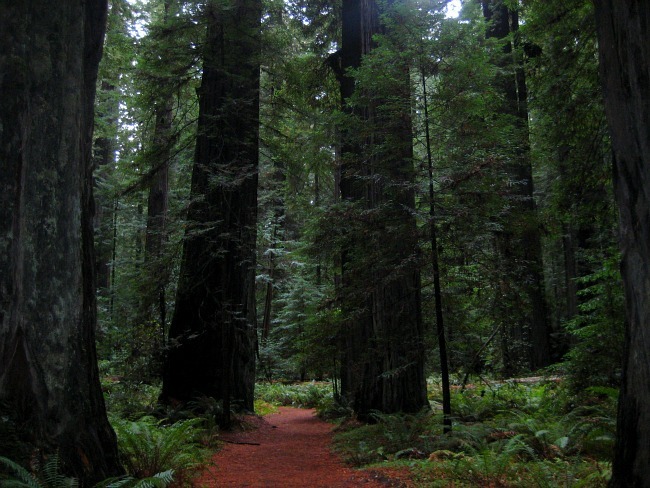 Other areas of the Pacific Northwest do have groves and small stands left (Muir Woods, East Bay’s Regional Parks…), but the parks in Humboldt are unique because they concentrate and connect large areas of contiguous habitat- up to 17,000 acres in places, of mostly uncut woodlands. It’s great because you can set out to hike for an entire day and get a sense of what a true forest feels like; the isolated temperatures inside a forest; how long it takes to actually get wet under a thick canopy when it’s raining hard; and so much life!- from banana slugs and ravens, to salmon, bear, and elk, in one day. The history of the hard work done by preservationists and private land owners to preserve these havens is here. Check out the shallow root base of a giant redwood. 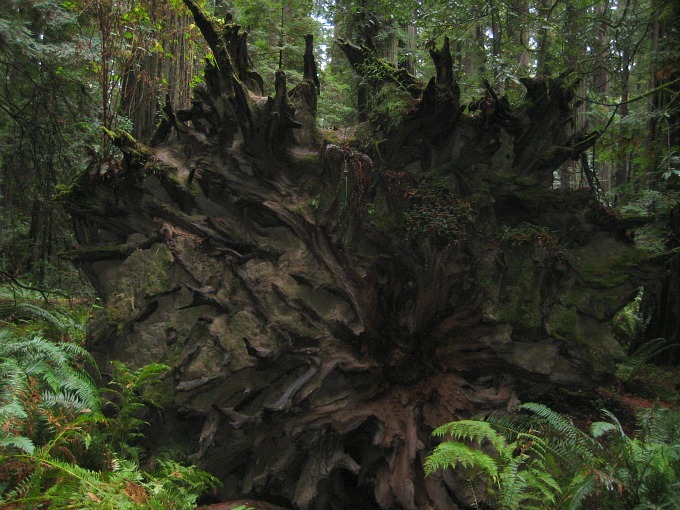 In 2006, the USGS reported a seismic reading for the fall of one tree that could be felt all the way to San Francisco. It feels odd to think of having to leave Oakland to see a redwood forest, because early explorers wrote that once entering “Contra Costa shores” (now Oakland) through the estuaries, and passing large Oak groves- the hills everywhere were covered with redwoods. You see remnants of this now- a few lone redwoods scattered in neighborhood yards and in parks about 10 minutes away. But this is ideal terrain for coastal redwoods; within 50 miles of the coast, cool and foggy air, good rainfall, and less than 2000 feet elevation. 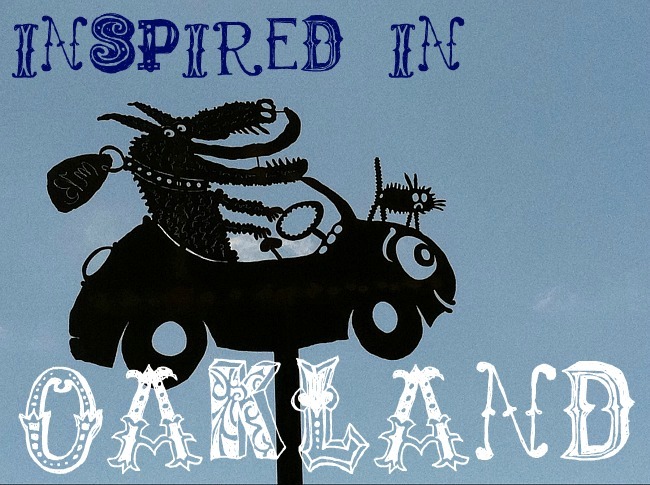 Spanish explorers wrote in the 1700’s, of using the eastern treeline- now Oakland’s high hills- to navigate their ships into the San Francisco Bay. One tree was reportedly the primary siting citadel for navigators. Perhaps this is the same tree that loggers also documented- 35 feet in girth, 400 feet tall. But there was no stopping the boom of building San Francisco, Oakland, and all the Bay cities to accommodate a gold rush. Beginning around 1848, with Sutter announcing his gold find in Sacramento, a sudden rush of new labor came by sea into San Francisco from around the world. And though the forests of the north coast became quiet as men took up shovels and pics and headed to the mines, it was short-lived. Soon the number of loggers and mills would quadruple: logging and sawmills paid far more than mining- for most workers. When the railroad was finished- its terminus ending in Oakland- cities had to be built quickly: hotels, housing, and a hub for commerce to handle the sudden, short-term, transient population. The first steam-powered saw mill came to the Oakland hills in 1850. With the added export of redwood, and the constant need to rebuild Bay cities after earthquakes and fires- Northern California’s forests were fast emptied. The last large redwood was reportedly cut from the “middle redwood hills” of Oakland in 1860 (source Oakland by B. Bagwell). This must mean, that the trees that we now see in our area, jetting up here and there- are relative babies, 160 years or younger. A “old” forest averages a mix of trees 600- 1200 years old, with the oldest around 2000 years. If you haven’t experienced a redwood forest, go. They are simply majestic. 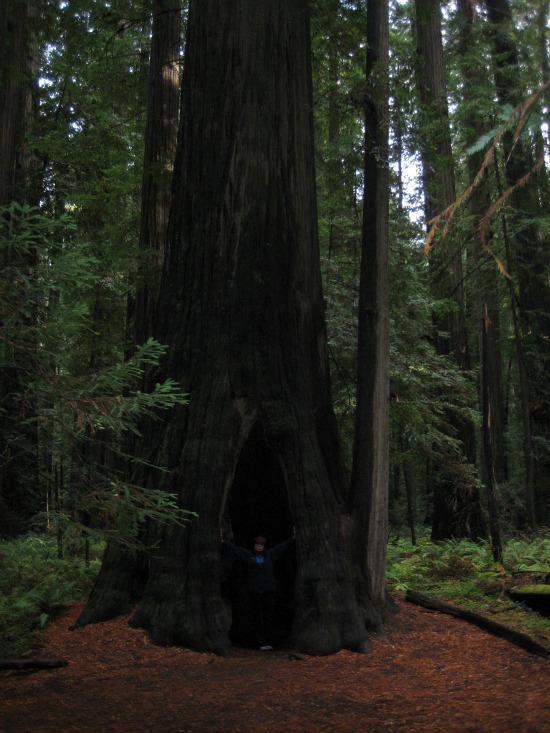 And there is nothing like a redwood giant to make you feel very young and very small. 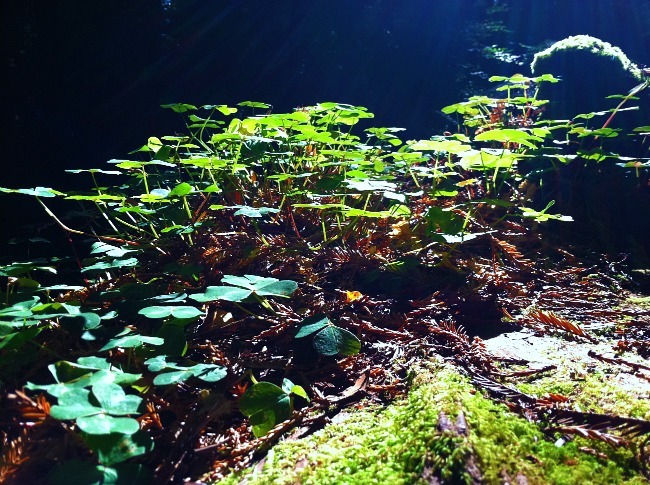 😉 I recommend Prairie Creek Redwoods State Park with hikes from 1 to 12 miles. They have a healthy herd of local Roosevelt elk. 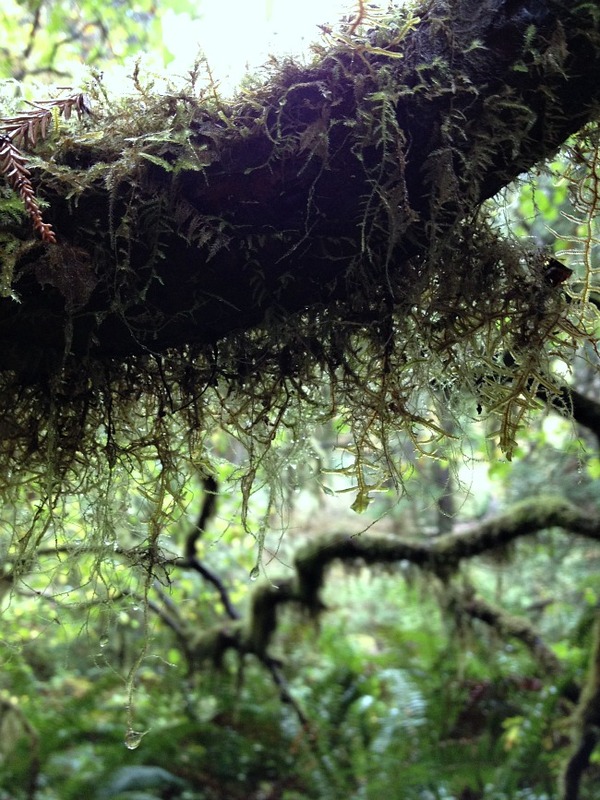 My favorite hike: Fern Canyon– from the campground to the ocean (this is a great source for all things Prairie Creek). And check here national parks site for more historical and ecological info. Oh- and on your way back, starting in October, be sure to stop to check out the rivers. Once the rains start, king or Chinook salmon and steelhead soon follow. You can see them swimming up in schools from any of the major bridges over the six rivers in the area, or in deeper creeks. We missed them this trip, but folks along the Eel River say they’ve just begun their upstream migration. 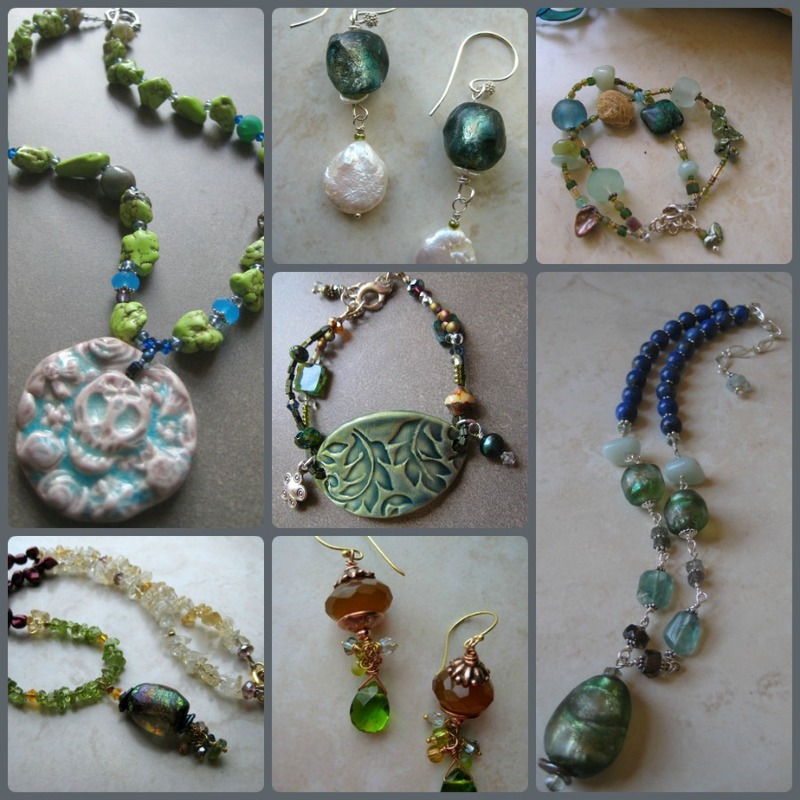 Twice this summer I brought my finished jewelry on the road to sell at shows; necklaces, earrings, bracelets – all laid- next to CDs on the merch table. In Germany, I think folks bought nearly all I had. I forgot to bring anything to present everything on (doh!). But folks must have had great imagination. Or deep empathy. Maybe it was the ability to wear and model amid close friends before buying. 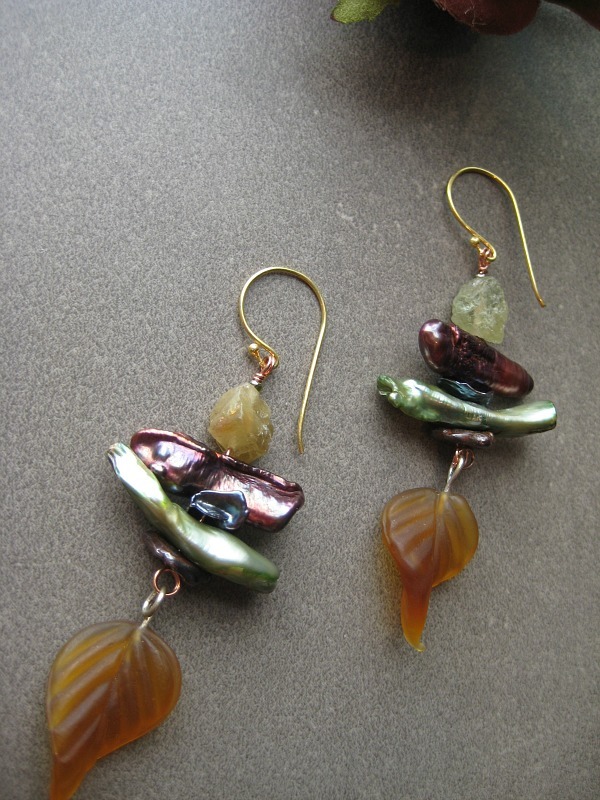 New Inspirations for Three Muses: Leaves & Biwa pearls with tourmaline. 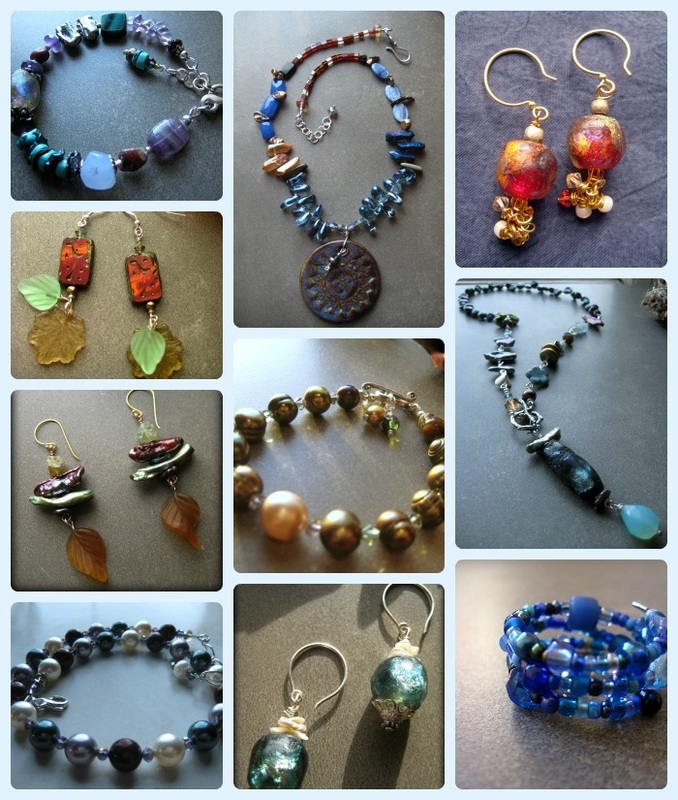 I love how she makes tiny batches of whatever the Muse inspires. Even if you ask her to recreate something, it will be different than before. Que bien. These large gorgeous olive pearls are Fall-ish & fun. I’ll add some with rust too. It’s time to stop hoarding. Fall is a great reminder for that. 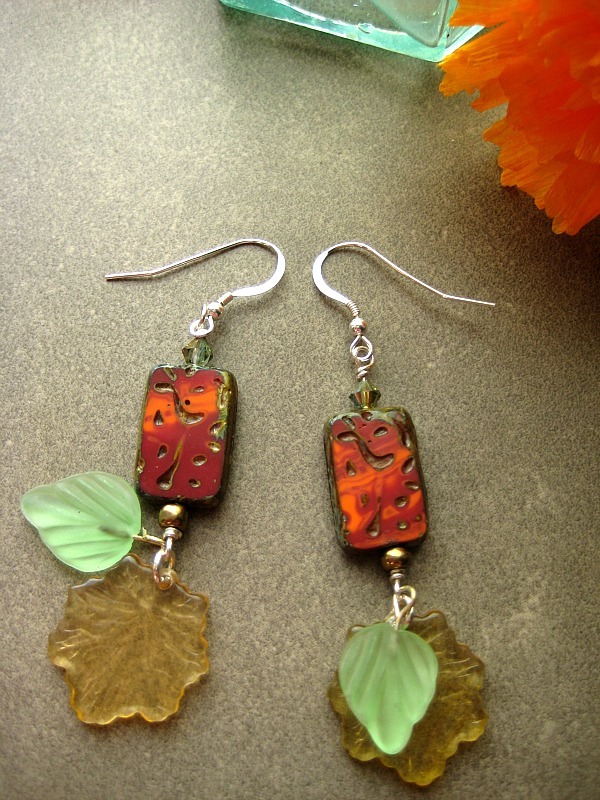 I’m going to be teaching at the new beadshop beginning tomorrow. Eeek! 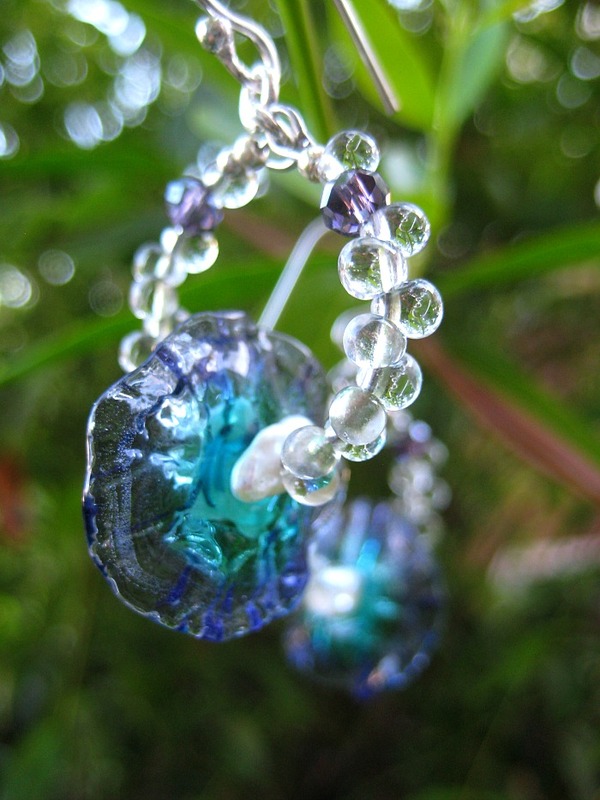 Though I’ve worked at a beadstore, teaching basics to a group is a new concept. And these classes are intensives- 3 hours! 2xEEK. Small groups. Selfishly, I hope to learn things from the other teachers and students. I’m ready to kick things up a notch.